I only managed to catch the first ‘Paddington’ film a couple of weeks back ahead of the sequel’s release and I was pleasantly surprised at how much I enjoyed a film I’d kind of written off as a throwaway piece of kid’s entertainment. 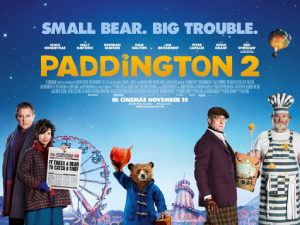 The success of that film made a follow up inevitable and I actually thought ‘Paddington 2’ was superior in just about every way to the original film. It retains the same charm despite adding a wealth of new characters, and I thought the overarching story was stronger than the original, with Hugh Grant a stellar addition as the new antagonist. The film begins by establishing that Paddington (Ben Whishaw) is now a fully ensconced member of the Brown family, spending his days cheering up the neighbours (with the exception of Peter Capaldi’s Mr. Curry) and helping Mr. Gruber (Jim Broadbent) in his antiques shop. His Aunt Lucy’s 100th birthday is coming up and he wants to get her a memorable present, but the pop-up book of London that takes his fancy is out of his price range. The first film featured some excellent slapstick comedy and the second is no let down in this regard either as we follow Paddington’s various failed attempts to get a job and earn some money to purchase the book, to often hilarious effect. Little does he know that someone else has their eye on the book, and Paddington unfortunately finds himself in the wrong place at the wrong time when the book is stolen from the antiques shop. A spell in jail awaits, necessitating the narrative diverging in two, splitting time between Paddington’s experiences in jail and the Brown family setting out to clear Paddington’s name. The sequences in jail are amongst the film’s best, bringing in Brendan Gleeson as an intimidating chef and featuring direction and escapades reminiscent of the doll house approach of Wes Anderson (most notably ‘The Grand Budapest Hotel’). On the outside we get to see more of Hugh Grant’s washed up actor Phoenix Buchanan, a superb creation that Grant plays with relish. Grant made his name as the go to British guy for romantic comedy roles but there’s a strong argument that his finest work has came in antagonistic roles and he is truly outstanding here. The rest of the cast is a little larger than last time and there are a lot more cameos than its predecessor but I felt they were handled well and didn’t detract from the overall story. There won’t be any surprises in how the story plays out and the conclusion is telegraphed, but ‘Paddington 2’ really earns the right to get away with it and it had me smiling throughout. Director Paul King showed his skill for seamlessly blending the nostalgic spirit of Michael Bond’s stories with the vibe of 21st century London in the first film and he’s done it again with the sequel. ‘Paddington 2’ is a sheer delight, a sequel that improves on its predecessor with an extra dose of heart and warmth, and a stronger story underpinning it all. As far as family entertainment goes, you’re unlikely to see anything better this winter, and I wholeheartedly recommend it.